Hybrid cars are considered dangerous. High voltage implies electrocution; initially people feared what would happen in the case of a crash or a service call. These concerns have been largely dismissed after countless accidents and repairs. 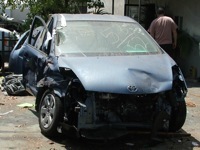 In fact hybrids have proven no more deadly than regular cars. But high voltage also entails batteries, and another rumor mill has been churning for almost ten years now about the financial threat of battery packs needing replacement. If you were foolish enough to purchase a hybrid, you were in for a monstrous repair bill sometime in the future (60k, 100k, whatever mileage seems grossly premature). I often hear HV batteries wrongly estimated at six to eight thousand dollars. As Prius swarm San Francisco today, it’s clear all this fear mongering has not deterred buyers. Hybrids are mainstream, and the ownership experience has proven to be an overwhelmingly pleasurable one. The threat of hybrids is only to those opposed to new technology and/or burning less gas. 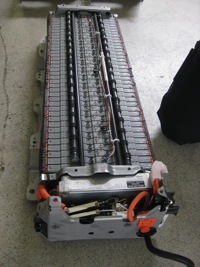 But the fate of the hybrid battery is still an important question and entirely relevant as these cars reach middle age. As hybrid specialists, Luscious Garage has unique insight into battery failures and the best means of repair. Not only to do we have the training to service high voltage safely and reliably, we also maintain a network of suppliers for competitive prices and continually research best practices for refurbishing depleted packs and/or recycling. Indeed, replacement packs are neither cheap nor casual to replace, but their prices and procedures are comparable to large jobs common to regular cars. Thus far we have seen battery failures outside of the factory warranty on two models: Gen 1 Toyota Prius (model year 2001, 2002, 2003) and the Honda Insight (model year 2000-2006). It’s no surprise that these are also the oldest hybrids on the road. We have seen one battery failure on a 2005 Honda Civic Hybrid, with only 50,000 miles on the clock, but this was an isolated case and was covered under warranty. We have not seen or heard of common failures on other models. Indeed the second generation Prius (2004-2009) battery has proven extraordinarily robust, with vehicles still running on the original pack well over 300,000 miles. This is a testament to the improvements to batteries as well as the management software on board. Other late model Toyota products can be expected to demonstrate equal longevity.